The rework machine line also called APR Product Line formerly Metcal BGA-rework that includes Scorpion,Scarab and older APR-5000 rework machine are now acquired by Desco Industries Incorporated. Of course we still will support You in this area of interest. 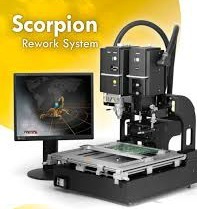 The Scorpion Advanced Package Rework System ensures both accurate component placement and custom tailored reflow profiles in one user friendly, single platform rework system. The Scorpion System redefines precision and addresses the technical demands presented by component manufacturers today. The challenges of array package rework, and the inability to easily inspect placement accuracy, call for a solution that allows for simultaneous viewing of Printed Circuit Board pads and component balls for accurate placement. The Scorpion Rework System fills this need with quick, accurate placement through the use of an all new vision system employing dual image overlay technology. This new vision system features LED lighting both top and bottom for shadow-free component visualization and component alignment. The HD camera is ready to go out of the box. smartTec will help you find the right products for your specific needs.